Four members of the McGill Quidditch team represented Canada at the Quidditch Summer Games earlier this week in Oxford, England. Derek Burrows (Chaser), Gregory Carlisle (Beater, Snitch), Plunger Parvulescu (Seeker) and Alain Desroches (Chaser) were members of the Team Canada squad that narrowly missed out on a bronze medal in a 60-50 loss to Australia. Team USA claimed the gold medal by thoroughly dismantling France by a score of 160-0. Four members of the McGill Quidditch team represented Canada at the Quidditch Summer Games earlier this week in Oxford, England. Derek Burrows (Chaser), Gregory Carlisle (Beater, Snitch), Plunger Parvulescu (Seeker) and Alain Desroches (Chaser) were members of the Team Canada squad that narrowly missed out on a bronze medal in a 60-50 loss to Australia. Team USA claimed the gold medal by thoroughly dismantling France by a score of 160-0. Queen’s University, the University of Ottawa and the University of Victoria each had three representatives on Team Canada, and the University of Toronto had one. The McGill Quidditch team defeated host team Carleton University at the Canadian Cup Quidditch tournament in Ottawa last October. 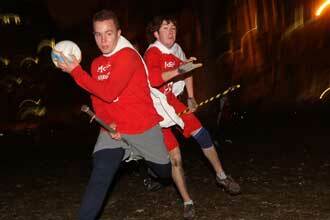 To learn more about Quidditch’s origins at McGill, read this Reporter article from November 2008: Anyone for Quidditch? For more recent McGill Quidditch news, read Bewitched by Quidditch, a December 2011 report from the McGill News.